The Fuji class pre-dreadnought battleships, 富士型戦艦 Fuji-gata senkan, were the first of their kind built for Japan. Notice the “For”, as like the following Shikishima class, Asahi and Mikasa (1900) they were all built in Great Britain, on British plans, and led by British-trained Japanese officers. Before building an impressive, modern force of battleships prior to WW1 fater than many other Nations, Japan had to built up first an industrial basis with capable naval yards and learn from other navies. The choice, after after rejection of the French in the late 1880s, fell naturally on the British, and it was virtually a reduced asiatic clone of the Royal Navy that won over the Russians in 1905. One of the many battleships which took part in these operations were the Fuji class. The Kashima was sunk, but the Fuji survived not only to see WW1 but also WW2 as a training vessel. The Mikasa is today the only pre-dreadnougt battleship of this era to have been preserved, the other one being the USS Olympia, an armoured cruiser. Prior to that ship, Japan had only two ex-Chinese armoured vessels. The first was the 7000 tonnes German-Built 1882’s Chin Yen, captured in the Sino-Japanese war of 1894, and the Chinese armored coastal ironclad Hei Yen (1890), a 2150 tonnes ships armed with a single turreted 10.1 in (260 mm) gun. Interestingly enough, the Japanese purchased the ex-Confederate ironclad Ram CSS Stonewall built in France (1864), which crossed the Atlantic only to see the end of the war, being captured and resold by the Federal government in 1867 to the Shogunate Force at war with the Emperor’s fleet. She was dircarded in 1888, but followed by the Ryujo, a British-built armoured corvette (1864), the Fuso, a British built Central battlery ironclad (1877) and two British-built armoured corvettes, the Kongo and Hiei, first of the name in 1877. 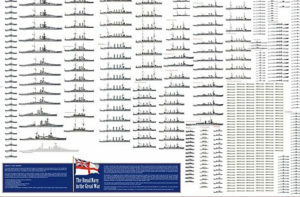 By the time the authorities had the right structures set in place and funding, modern pre-dreadnoughts were ordered from Great Britain, as part of the 1893 programme. This was just prior to the Sino-Japanese War, the only serious contender in this area, notably over Korea. They were indeed ordered to counter the Chin Yen class, but were more modern, faster and more powerful in any case. GC Macrow naval design office in UK (Thames iron Wks yard) which received the order planned a modified Royal Sovereign design for the Japanese. 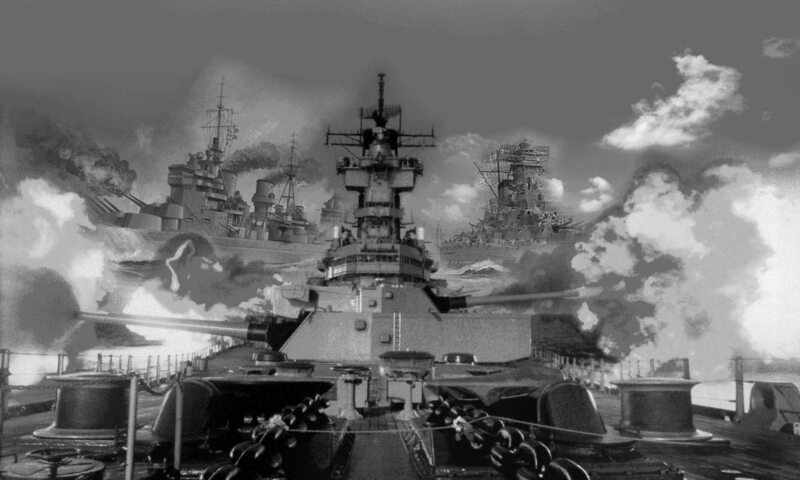 The main modification was to try to fit more powerful guns, yet of smaller caliber. The idea was to spare some weight that can be redistributed in protection of the turrets. For the same reason, protection for the secondary artillery was moderate, only four being in barbettes, the other ones being protected on the main deck by simple shields. All in all this design was well-balanced and the ships, ordered at Thames Iron Works, Poplar and Armstrong Withworth, Elswick (designer Philip Watts) in August and December 1894, were launched in january and Februay 1896 and completed in August and September 1897 way too late for the war they were planned for. But they served with distinction in 1905. Both ships, compared to their British equivalents were about 2,000 long tons smaller, 1 knot (1.9 km/h; 1.2 mph) faster, had superior Harvey armour, with Majestic-class range guns, but protected by gun turrets for the first time. Kashima also innovated as having a balanced rudder, paid however by a weaker stern. The battleships were powered by two Humphrys Tennant 3-cylinder vertical triple-expansion steam engines. Both served one 17-foot (5.18 m) propeller. The steam was procured by ten or fourteen (Kashima) cylindrical, single-ended boilers. Their working pressure was 10.898 kg/cm2 (1,069 kPa; 155 psi) with a water pressure of 155 Ib/in, and they were rated at 13,500 horsepower total (10,100 kW, forced draught) for a designed top speed of 18.25 knots (33.80 km/h; 21.00 mph). They exceeded these figures on trials, up to 18.66 to 19.46 knots (34.56 to 36.04 km/h; 21.47 to 22.39 mph). Interestingy enough the Kashima had a way shorter turning circle, obtained merely by accident: The builder had to cut away the keel aft towards the rudder. But this hard turns were only possible by causing a huge strain on the hull. Their funnels were placed on the centreline unlike their British models. To sustain their designed range of 4,000 nautical miles (7,400 km; 4,600 mi) at 10 knots (19 km/h; 12 mph), they carried 1,620 tonnes (1,590 long tons) of coal. 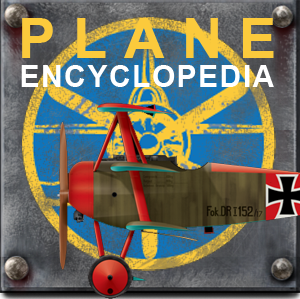 Energy was completed by three electric dynamos, for 32 kilowatts (43 hp) each. The general scheme proceeded from the Royal Sovereigns except for their superior Harvey armour (but same thickness of compound armour). Main belt was 8 feet (2.4 m) high, 3 feet (0.9 m) above the waterline (normal load) and 18 inches (457 mm) thick, reduced to 16, then 14 inches (356 mm) at the ends. There was a 102 mm strake of armour running between the barbettes for plunging fire. Above and behind the belt were 14 inches to 9 inches (229 mm) thickness armour. Diagonal forward bulkheads were 14 inches thick, rear 12 inches (305 mm) thick, connecting the barbettes. Casemates and barbette hoods were 6 inches thick and the forward conning tower was 14 inches thick. Deck protection counted 2.5 inches (64 mm) armour plates, while the hulls had double bottoms and were subdivided into 181 watertight compartments. To protect the engine rooms, a watertight centreline bulkhead separated these and the boiler rooms, which were further separated by a transverse bulkhead. Their main battery consisted of four hydraulically operated Elswick Ordnance Company 40-calibre Type 41 twelve-inch guns. They were still mounted the old way, in pear-shaped barbettes fore and aft of the main superstructure. These had a firing arc of 240° and the cradles had a maximum elevation/depression of +15° −5°. The barbettes armoured hoods were in fact fully-feldged turrets to protect the gun crews, although the mountings were repeats of the Majestic-class battleships. Because of this, reloading could be made in just one position which slowed the rate of fire considerably. However, 18 shells were stowed in each turret already (not a safety according to poserioir measures!) allowig some limited firing at any angle. These 850-pound (386 kg) projectiles had a muzzle velocity of 2,400 ft/s (730 m/s) for a range of about 16,000 yards (15,000 m). Secondary armament consisted of ten 40-calibre Type 41 six-inch quick-firing guns. Four in the main deck casemates, six on the upper deck. 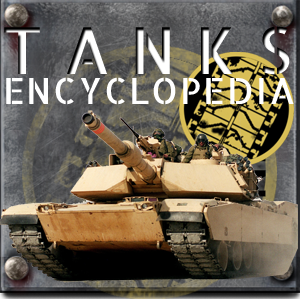 Each fired a 100-pound (45 kg) shell at 2,300 ft/s (700 m/s). Tertiary armament comprised fourteen 47mm (1.9 in) QF three-pounder Hotchkiss gun, ten 47mm 2.5 pounder of the same brand, firing 3.2-pound (1.5 kg) shells at 1,927 ft/s -587 m/s) to 2.5-pound (1.1 kg) shells at 1,420 ft/s (430 m/s). For close quarters, they had five 18-inch torpedo tubes (one in the bow, above water and four submerged on each broadside). In 1901, thay traded 16 of their guns for modern QF 12-pounder 12 cwt firing 12.5-pound (5.7 kg) at 2,359 ft/s (719 m/s). Only the older ones in the fighting tops remained. 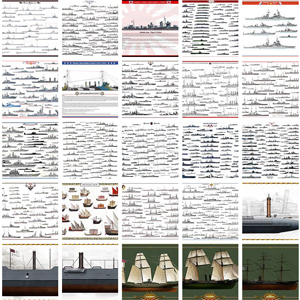 They fact that both ships missed WW1 don’t qualified them for study, as they were Japan’s first own battleships and fought effectively in 1905. 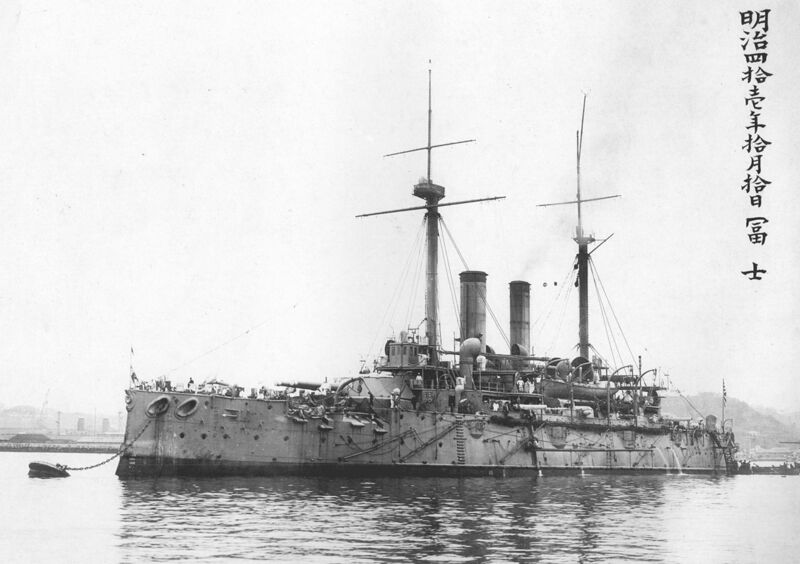 Soon after her introduction into the Japanese Navy after her arrival in February 1898, the new battleship made sensation. 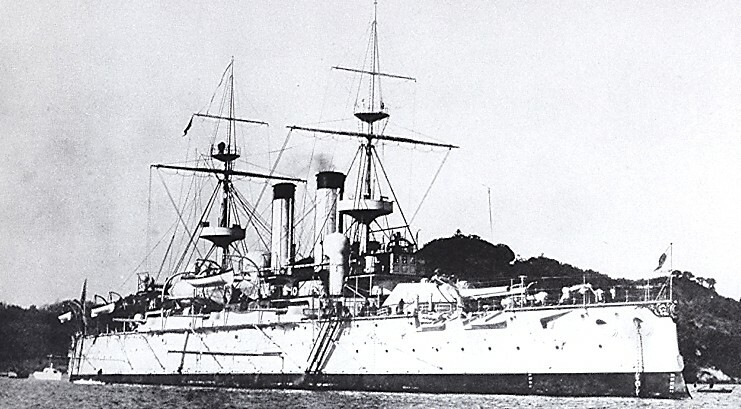 Kashima and her sister were found in the 1st Division of the 1st Fleet when the 1904 Russo-Japanese war erupted. Both participated in the Battle of Port Arthur (9 February) led by Admiral Tōgō Heihachirō. Tōgō chose to attack the Russian coastal defences with his main artillery while dealing with Russian pacific fleet ships with his secondary artillery, which proved to be a poor decision, inflicting little damage on the Russians. Both ships later on March, 10, 1904, shelled the harbour in indirect fire, causing little damage. Both ships also took part in the 13 April action to succesfully lure out two Russian battleships, one hitting a mine when back. And while the Japanese resumed the harbour bombardment, the Russians laid more mines, for future dire consequences. Kashima indeed sealed her fate on May, 14 when hitting mines after trying to rescue crippled battleship Hatsuse, also struck by a mine. She was towed in turn away from the minefield, but five hours later she had to be evacuated and eventually capsized and sank. As saif above, Fuji arrived in japan in February and was soon at the spearhead of the Japanese Navy. 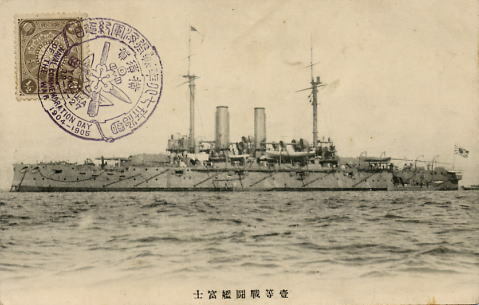 At port Arthur in 1905, Admiral Togo risky decision to split his fire had grave consequences for the Fuji as she was hit twice, deploring two KiA and 10 wounded. On march 10, when shelling blindly the harbour, she was hit again. On the Battle of the Yellow Sea in August 1904 she was spared as the Russians concentrated on Adm. Togo flagship, but the next year at tsushima she took twelve hits, one which penetrating the hood of the rear barbette, and detonated propellant charges with some loss of lives. However the fire was put up and the ship apparently delivered the fatal blow which sank the Borodino. In 1910 Fuji undergone a refit, seeing her cylindrical boilers replaced by Miyabara water-tube models while her main armament was changed for new Japanese-built guns. She was then classed as a first-class coast defence and served throughout WW1 in this role, until being disarmed in 1922. According to the Washington treaty she was kept as a floating barrack and training center at Yokosuka NyD, and was still in service by 1945 when she was attacked and sank by American carrier aircrafts on 18 July, skining just after peace was signed. She was scrapped after 1948, having the only “honor” to have been conceived for a 19th century war (with China), fought against the Russians, and see WW1 and the atomic age.